An Australian newspaper which found itself at the centre of a race row over its cartoonist's depiction of Serena Williams has come out strongly in support of the artist. The Herald Sun has hit out at those who criticised Mark Knight's drawing, which shows Williams jumping over a broken racquet next to a baby's dummy. Critics said the cartoon used racist and sexist stereotypes. But that did not stop the newspaper reprinting the image on its front page. 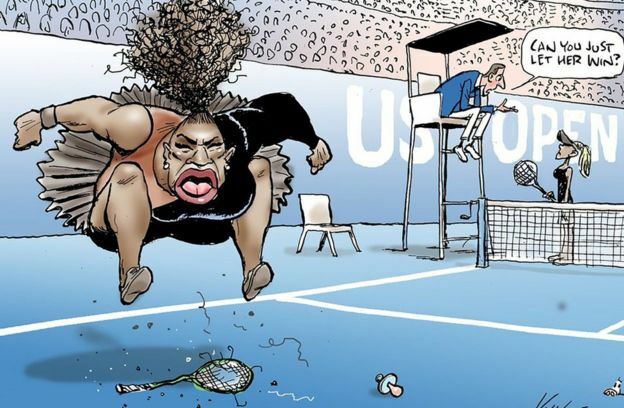 Underneath the headline "Welcome to PC world", the newspaper wrote: "If the self-appointed censors of Mark Knight get their way on his Serena Williams cartoon, our new politically correct life will be very dull indeed". Knight's original drawing, published in the Herald Sun on Monday, referenced Williams's outburst during the US Open final at the weekend, showing the umpire asking Japan's Naomi Osaka: "Can you just let her win?" It led people, including author J. K. Rowling, to accuse the newspaper of racism. "Well done on reducing one of the greatest sportswomen alive to racist and sexist tropes and turning a second great sportswoman into a faceless prop," Rowling wrote on Twitter. Some also said Knight had "whitewashed" Osaka, whose father is Haitian and mother Japanese. She was drawn as a white woman with blonde hair. Herald Sun editor Damon Johnston also jumped to Knight's defence, saying in a tweet that the cartoon "rightly mocks poor behaviour by a tennis legend... Mark has the full support of everyone". He later shared an image of the front page, which included a series of other cartoons the newspaper was suggesting could offend the "self-appointed censors". It once again provoked a reaction on social media - with many pointing to the irony of the Herald Sun having its own "tantrum". "I'm genuinely embarrassed for you," Julie Stoddart said in a tweet, while Ken McAlpine tweeted: "Poor little newspaper needs a hug." Others, however, backed the newspaper's stance. "This will trigger the perpetually offended," tweeted @RohanCT. Another Twitter user, Paul Pellen, added: "Outrage for the sake of outrage! Lefties fingers must be bleeding! @Knightcartoons, keep it up. There are still some of us who enjoy humour." The cartoonist said on Tuesday that "the world has just gone crazy", telling the Australian Broadcasting Corporation it "was just about Serena on the day having a tantrum".